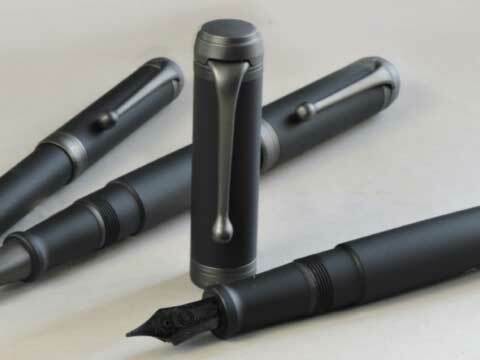 Talentum is the pen of the new millennium. Past and future, tradition and innovation blend together in an instrument of modern design and extraordinary technical precision. Now the new Talentum Full Metal Black and Full Black. Choose between the Full Metal Black with the ruthenium plated cap or the Full Black with ruthenium plated trim. The fountain pens come with Auroras premier #6 nib in 14k with ebonite feed. These pens are cartridge or converter fill ti keep the weight down and make it easy to clean.